Julie Sinnamon is CEO of Enterprise Ireland, a government agency responsible for the growth of Irish-owned businesses abroad. Enterprise Ireland works in partnership with Irish enterprises to help them start, grow, innovate and win export sales in global markets. 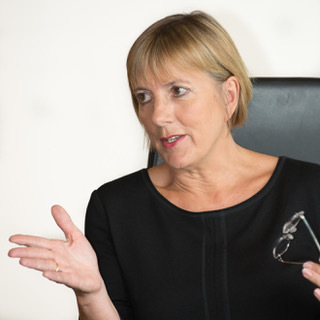 Prior to her appointment to CEO in November 2013, Julie held a number of senior public sector positions, spanning a 30-year career in Enterprise Ireland and IDA Ireland. Julie is a member of the Board and Investment Committee of Enterprise Ireland and a member of the Investment Committee of the Irish Strategic Investment Fund, part of the National Treasury Management Agency. She has been recently appointed to the National Competitiveness Council. She is also a Board Member of the Social Entrepreneurs Ireland and Young Scientist & Technology Exhibition Limited. Julie is a strong proponent of initiatives that drive diversity and the building of balanced teams in the workplace. She is a champion for women engaging at all levels within both the public and private sector, not as an end in itself, but because of clear evidence of the positive impact of diversity on corporate performance. A business graduate of the University of Ulster, Julie also has a Masters in International Business (Fordham and IMI) and is a graduate of the Stanford Executive Programme, USA. I think all of us are shaped, to a greater or lesser extent by our life experiences. Certainly, growing up as the middle child in a large family (I have 12 siblings, 9 sisters and 3 brothers) helped me to learn survival skills, resilience and to be a good team player! We had a poultry company and a car business, both family businesses, so I began my working life early, serving fuel at the family garage! We experienced entrepreneurship and hard work at a young age, which undoubtedly shaped my outlook on life. My mother had a rota for everything in the house, so we all knew our jobs! Our parents always encouraged us to work hard and take responsibility. My family also taught me the value of humility, which was an easy virtue to extol in a household of 15! These qualities of self-belief and humility helped me hugely during my career and they have sustained me in times of challenge and frustration, and even disappointment throughout my working life. My six older sisters followed my mother’s career into teaching, but from an early age, I had a strong interest in business, probably seeded in those early years, working in the family business. I went on to study business at Ulster University and I graduated with a BA in Business Studies in 1981. During my time at Ulster University, I spent some time working in Dublin. I was fascinated by the number of foreign-owned multinationals that had set-up in and around Dublin. That became the subject of my final thesis: ‘The impact of the foreign-owned multi-national sector on the domestic economy’, which led me to a job with IDA Ireland, one of the most successful foreign direct investment agencies in the world. How has your previous employment experience aided your tenure at Enterprise Ireland? Certainly, my engagement in the family business exposed me to the challenges of small businesses from an early age. Working for IDA Ireland, I was working with global businesses. I quickly recognised that, as a small, open economy, Ireland’s economic success is intrinsically linked to its global success. IDA Ireland has been enormously successful in promoting Ireland as an excellent location for foreign-owned multi-nationals to establish a European base. However, my heart has always been in the cut and thrust of entrepreneurship, and inorganic growth, through exports. So, when an opportunity came to move across to work with Irish owned enterprise, with Enterprise Ireland, I grabbed it! I feel incredibly fortunate to do the work I do. I love working with Irish companies with innovative products and services that literally change lives of people all over the world, knowing that their export success creates and sustains jobs in towns and villages all over Ireland. It is a privilege to work with these companies and I am delighted to represent them on an international stage. I love telling the world about the excellent innovations coming out of Ireland! What have the challenges been during your tenure at Enterprise Ireland? I have been working at Enterprise Ireland for many years, and there have been many challenges for Irish companies and the Irish economy during my tenure. In the 1980’s, the key challenge was to make the shift from a predominantly agriculture-driven economy to the knowledge economy that we have today, focused on services and high-tech industries. In the noughties, the global recession was a significant challenge and this impacted significantly on the Irish economy. Then in 2008, we had the Irish banking crisis, a double whammy. The key challenge for Enterprise Ireland and for the Irish government was job creation. Our strategy ‘Driving Enterprise, Delivering Jobs 2014-2016’ was about driving exports of Irish companies, to deliver jobs in Ireland. By 2014, the Irish economy began to show signs of recovery, growing by 4.8%, making Ireland the fastest growing economy in the European Union. Irish exports are widely acknowledged for its contribution to Ireland’s economic recovery and continued growth. It’s fair to say that the ‘Brexit’ decision represents the biggest challenge to face Irish enterprise for the past 50 years. The implications are massive for Ireland and for Irish companies because the UK is our largest market. In 2016, 35% of exports of Enterprise Ireland companies went to the UK, but some traditional sectors such as food and construction, are particularly exposed. In addition, the UK is also most often the first market of export for Irish companies. We are working hard to encourage Irish companies to prepare now, not to wait until the March 2019 timeline. Our business advisers are engaging one-to-one with companies most affected to help them address the challenges of Brexit through innovation and addressing productivity issues. A key response to the challenges of Brexit is market diversification. We are leading a major campaign to increase the exports of Enterprise Ireland backed companies to markets beyond the UK by 2020 by 50%, with a major focus on the Eurozone. What have been the highlights during your tenure at Enterprise Ireland? The first is the progress we have made in encouraging more women to come forward to start new businesses. Back in 2011, just 7% of Enterprise Ireland backed start-ups had a female founder. Fast forward to 2016 and the figure has jumped to 22%, thanks to initiatives such as our female-only financial funds, female capability development programs, supports for female role models and networking events. This is important, not to be nice to women, or because I am a woman myself! It’s because, to continue to be successful as a nation, we need to use all our resources. And women make up 50% of our resources! The second is in seeing first-hand the global demand and recognition for Irish products or services. I love when a global buyer tells me that they searched the world for a particular service or product, and they found the best solution in Ireland! For example, I visited the Singapore Stock Exchange and saw that Corvil Technologies had provided the software. And Aerogen, a company in Galway that developed the world’s first aerosol vaccine, is saving the lives of thousands of children across Africa. The best career advice I ever received and the advice I would give to others is to do something you love. You are far more likely to be good at something if you enjoy doing it. We all work long hours, and with technology, it is increasingly difficult to get fully away from work. It is therefore critical that we enjoy the work that we do. I am really fortunate that I am doing a job that is contributing to the future wealth and prosperity of Ireland. Push your personal boundaries: Life has a way of throwing things at you, that you don’t expect and probably won’t like, but if you can remain open to these challenges, and see them as opportunities. They have the potential to shape your life in a way that you cannot know in advance. Place a high value on the friendships you make along the way. I have been fortunate to have been surrounded by great colleagues along the way, many since the very early stages of my career and still, their friendship and support endures. These are people who are kind enough to advise but not to judge. Find yourself a strong Mentor and an Advocate – there is a difference! A Mentor speaks to you, and Advocate speaks for you! I think we all need both! Not very well! I think it’s a struggle for many people, particularly for women. However, if you are working on something you love, it helps! I also believe that making time for exercise is important. And spending time with family and friends really helps to relax. One of the key issues for women in the workplace is confidence. So often women do not appreciate their capability and this holds them back from reaching their full potential! I have benefited hugely from very positive mentors in my career. They have guided me and advised me at critical stages of my career. Their advice has been invaluable. My first boss in IDA Ireland was female. She is someone who has played a crucial role for me and is still a mentor. She has gone on to inspire many more women in business. In my personal life, my father was a great mentor and I had strong role models in my grandmother and my mother, who were both strong women. My mother lived in that era when you had to give up your job once you got married. But she ploughed straight into the family business, she was very active in running it with my father. Ireland has had two great female Presidents, Mary Robinson and Mary McAleese, who have been truly inspirational, not just in their role as President, but also in taking a stand and making a difference on human rights and other global issues. Recently I read ‘I am Malala’ the story of a young girl born in Mingora, Pakistan, where she was banned from attending school. I found her story inspiring. Malala has become an activist for female education and the youngest Nobel Prize laureate. Her words: ‘I tell my story not because it is unique because it is not unique, it is the story of many girls.’ Malala’s advocacy has grown into an international movement and she is a remarkable role model for young people everywhere. What do you want Enterprise Ireland to accomplish in the next year? I would like to see Enterprise Ireland deliver the continued record growth of Irish enterprise and responding to the Brexit challenges, by developing strong positions in diversified global markets.